My wife and I are homeschooling my son, and so I work with him on his mathematics. For the first part of the year, our experiences have been fairly informal, but I feel like he and I will benefit from more structure, and so I’m planning on writing lessons and keeping track of the resources we have used, as well as reflecting on those lessons to help me plan what’s next. My son’s number sense and understanding of number operations is fairly strong. Our work here will continue informally, but for at least the next month, I’m going to focus on geometry with him. 2.G.A.1. Recognize and draw shapes having specified attributes, such as a given number of angles or a given number of equal faces (Sizes are compared directly or visually, not compared by measuring.). Identify triangles, quadrilaterals, pentagons, hexagons, and cubes. 2.G.A.2. Partition a rectangle into rows and columns of same-size squares and count to find the total number of them. My guess is that my son would find all of these tasks fairly easy to do, but I plan on spending our first few days together doing these tasks, and seeing if I can surface my son’s understandings and misunderstandings related to these standards. In terms of a more open-ended project, I suspect that the creation of mathematical art with polygons may be appropriate. 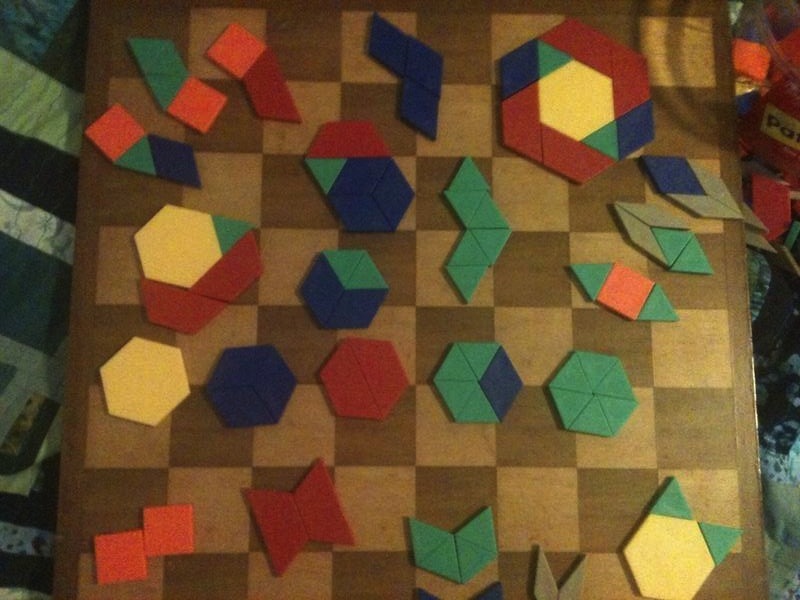 For example, my son and I recently created as many hexagons as we could using his pattern blocks (We made one mistake. Can you find it?). This entry was posted in Lesson planning and tagged Common Core 2.G.A.1, Common Core 2.G.A.2, Common Core 2.G.A.3, geometry, Grade 2. Bookmark the permalink.